← The. Best. Day. Of. Eating. Ever. Nyonya cuisine is famous across Malaysia, but particularly in Penang. 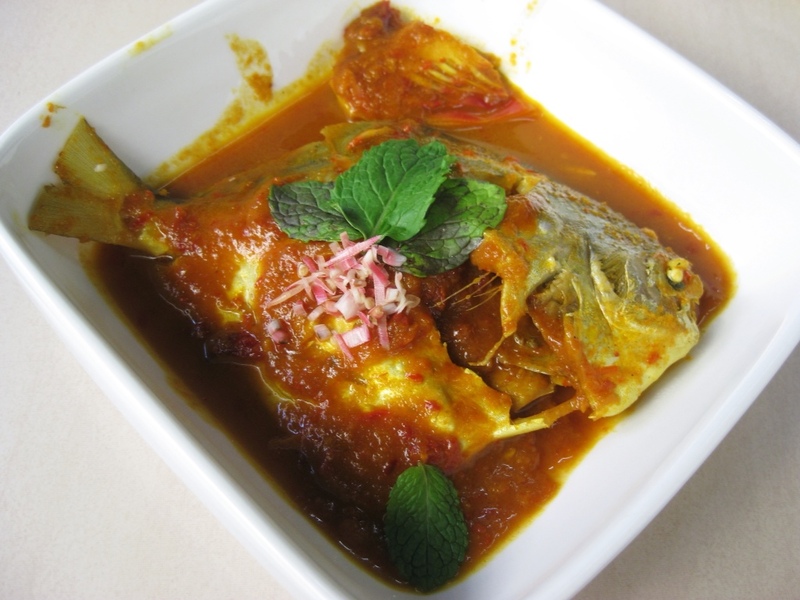 Nyonya refers to the descendants of the original Chinese traders who came to Malaysia in the sixteenth century. These early Chinese immigrants brought their traditional Hokkien recipes but often couldn’t get the ingredients they were accustomed to at home. They began using the ingredients native to Malaysia, including ginger flower, galangal, and coconut, as substitutes in their dishes. As they got to know and build trust with their Malay neighbors the two communities began exchanging recipes, and the result is a fusion cuisine between Chinese and Malaysian dishes. Like the best cultural exchanges, the results respected the essence of the source cultures while subtly altering and evolving them into something unique, and in this case, delicious. My Nyonya culinary guide was Pearly Kee, a fifth generation Penang Nyonya. Over two days together, we cooked an ambitious combination of Nyonya, Chinese, and Penang specialities. Arguably the most famous dish from Penang is Assam Laksa. It is a spicy and sour fish soup made with thick round rice noodles and it uses tamarind liberally to create its characteristic sour flavor. 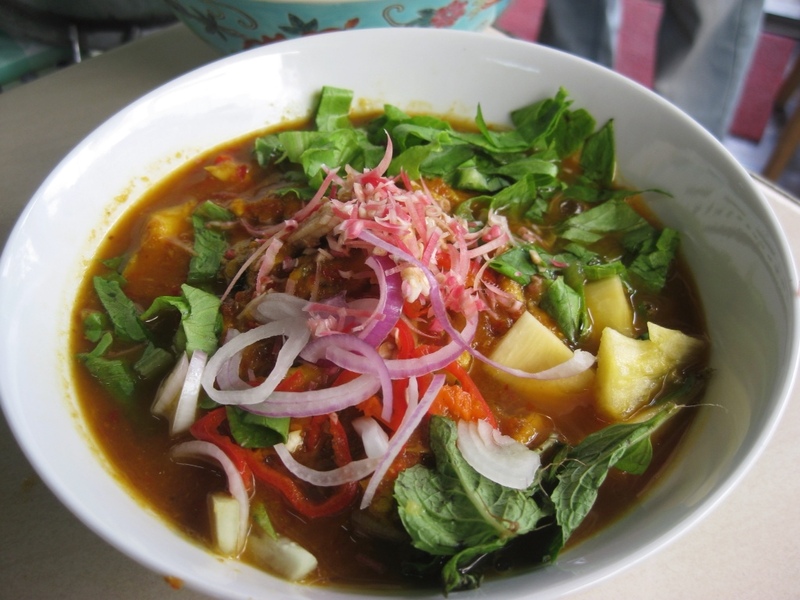 The base of the soup comes from an elaborate spice paste which includes fresh and dried chilies, fresh turmeric root, lemongrass, galangal, shallots, garlic, and shrimp paste. The spice paste is boiled with tamarind water and once the broth is almost ready, whole mackerel are put into the soup to create the fish flavor in the broth. The fish are removed once they are cooked and the bone-free flesh is put back into the soup. The garnish is also a critical part of the dish – I filled my empty bowl with uncooked mint leaves, pineapple slices, onion, cucumber slices, fresh chili, sprouts, and lettuce and then poured the broth on top of this mixture. The result was distinctive and clearly of the best quality – sour, spicy, and sweet at the same time without being overly fishy. 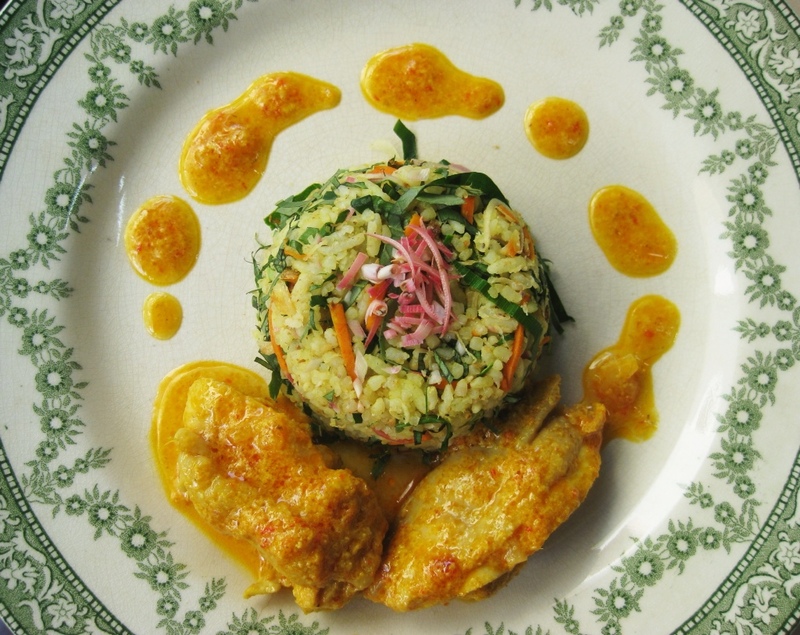 One of my other favorite recipes from Pearly was Nasi Ulam or jungle rice. 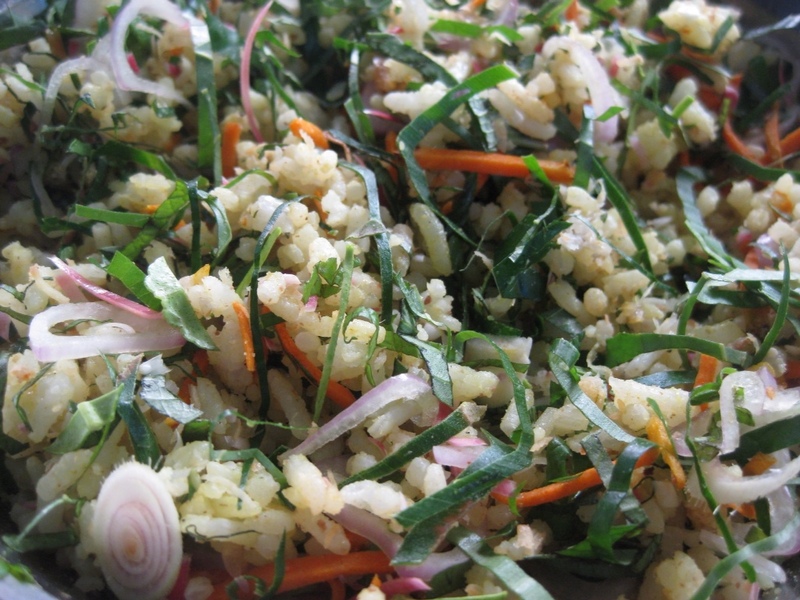 This refreshing dish was essentially a richly flavored salad. While the assembly of the salad was fairly straightforward, the ingredients were pretty exotic and labor intensive to find and prepare by my standards. We fried a piece of salt toasted kurau (which is basically a dried steak-like fish) then ground up the fish with a mortar and pestle. We did the same with dried shrimp, with ground coconut, and with shrimp paste. When we eventually combined these ingredients with salt and pepper in our rice, it was already delicious, even before we added all the fresh greens. We finely sliced eight or nine different leafy greens, including “chicken poo leaf” (that’s a direct translation from Pearly – apparently there is not another English name for it since it doesn’t exist in Western countries), turmeric leaf, polygonum leaf (used in laksa), cekur (wild ginger) leaf, kaduk (wild pepper) leaf, kaffir lime leaf, thai basil leaf, mint, ginger flower, lemongrass, fresh turmeric, and shallots. Whew, I’m getting tired just thinking about all that chopping, much less trying to track down all these ingredients. But the result was truly fantastic and I will definitely try some bastardized variation of it at home, once I figure out what kinds of ingredients I can get my hands on. Step 1 of jungle rice: chop up fresh turmeric root and mix it with the rice to create that nice yellow color. 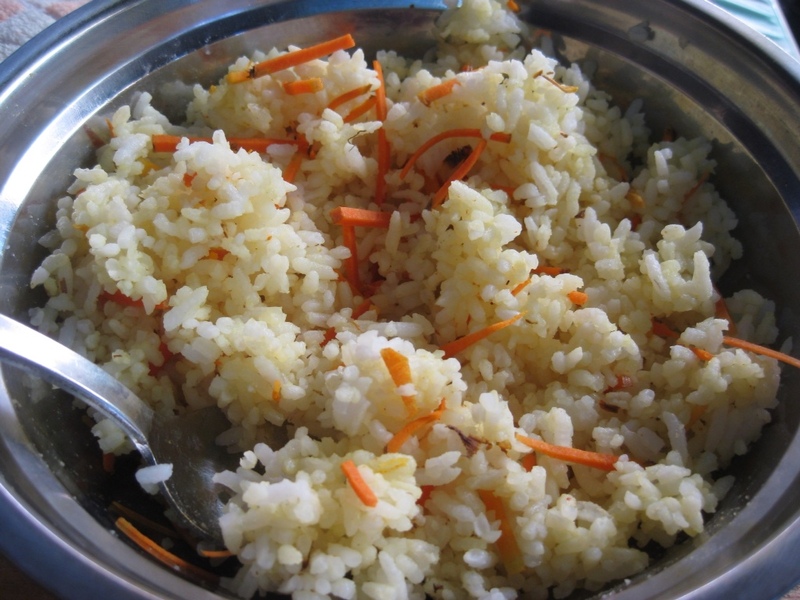 As an added bonus, your fingernails will now match your rice. Since we cooked so many different dishes, each of them fairly elaborate – a hallmark of Nyonya cuisine – I’ll just give you a quick rundown on the others. Chicken Curry Kapitan: This is a famous dish across cultures here, and both Nazlina (my Malay cooking teacher – more on that class soon) and Pearly told me similar versions of the story behind its name. Rulers were called captains back in the day, and the Chinese immigrants to Penang pronounced it as Kapitan. One day the captain’s Chinese chef tried a variation of a local Malay dish for dinner. Licking his whiskers with enjoyment, the captain asked what the dish was. The chef was at a loss – he had no idea what the local name was for his cross-cultural creation. So he replied, “Chicken curry, kapitan.” And so was born one of the most famous fusion dishes in Malaysia. The curry is thick and flavorful, using coconut milk, lemongrass, candlenut, chili, fresh turmeric, galangal, garlic, and lime juice. Sambal Goreng: Prawns cooked in a cashew nut and coconut milk sauce with a more subtle flavor than some of the other dishes. 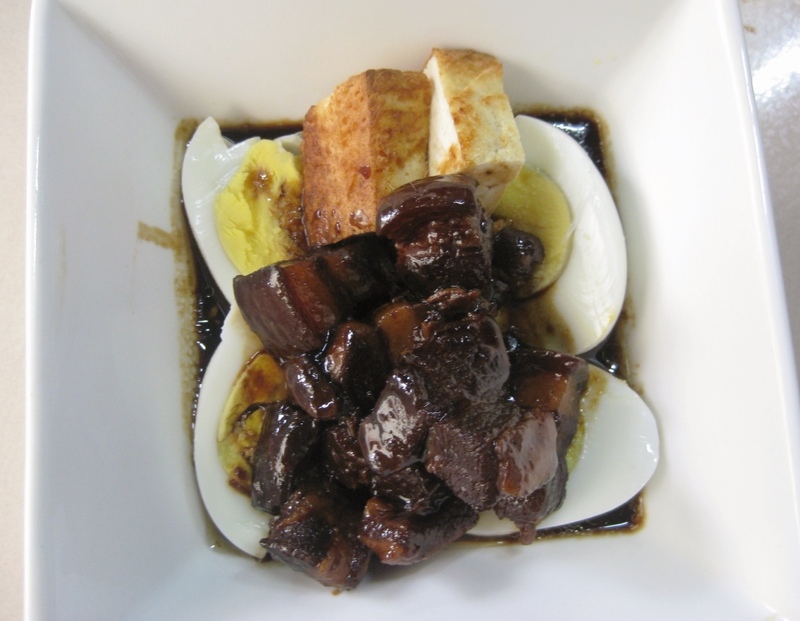 Tau Ewe Bak or dark sauce pork: A rich braised pork dish marinated in soy sauce, dark soy sauce (a slightly bitter reduction, different from the sweet Indonesian kecap manis), sugar, salt, and white peppercorn and served with fried tofu and a hard boiled egg. 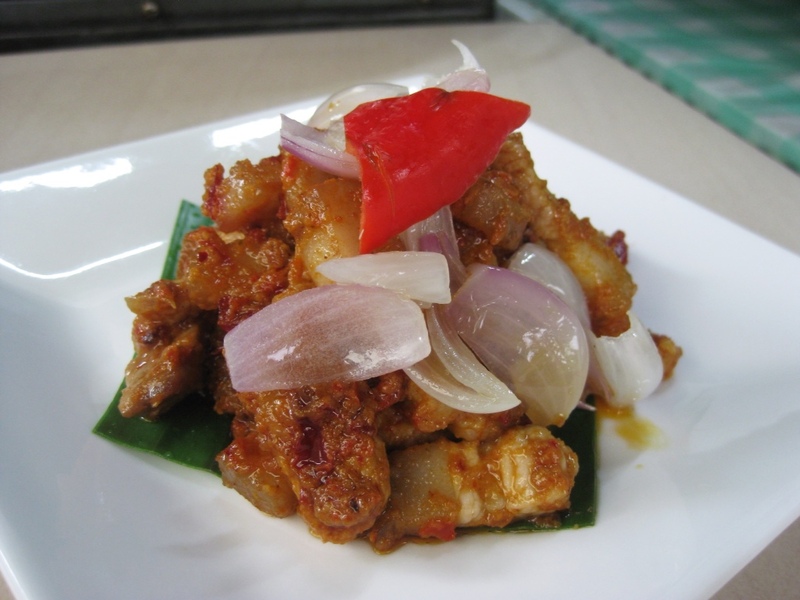 Bar char rempah: Stir fried spicy pork with chilies, candlenut, shallots, and shrimp paste. The dish was flavorful and relatively light, compared to some of the other heavier sauces. According to Pearly, this dish is a bridge between the dark sauce pork, which is squarely Chinese, and the Sambal Goreng, which is squarely Nyonya because it starts to use local Malay ingredients but retains a strong Chinese influence. Curry Fish Tumis: A boiled fish with a spicy sauce, similar to Laksa but served with the whole fish and more of a sauce than a soup. Kuih Koci Santan: This is the Nyonya variation on the Malay Kueh Koci that I made in KL. 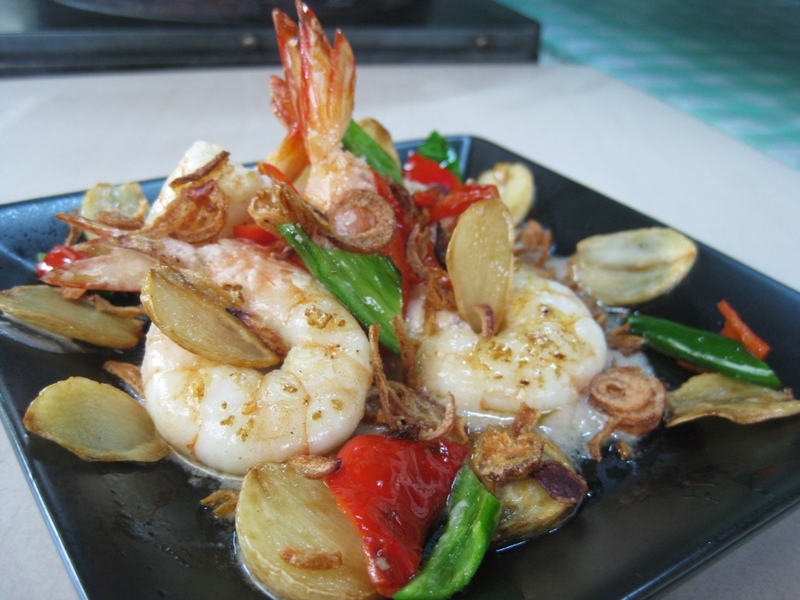 This dish is much heavier on the salty part of the sweet-salty combination and uses the glutinous rice flour in a sauce rather than as the core of the dish. 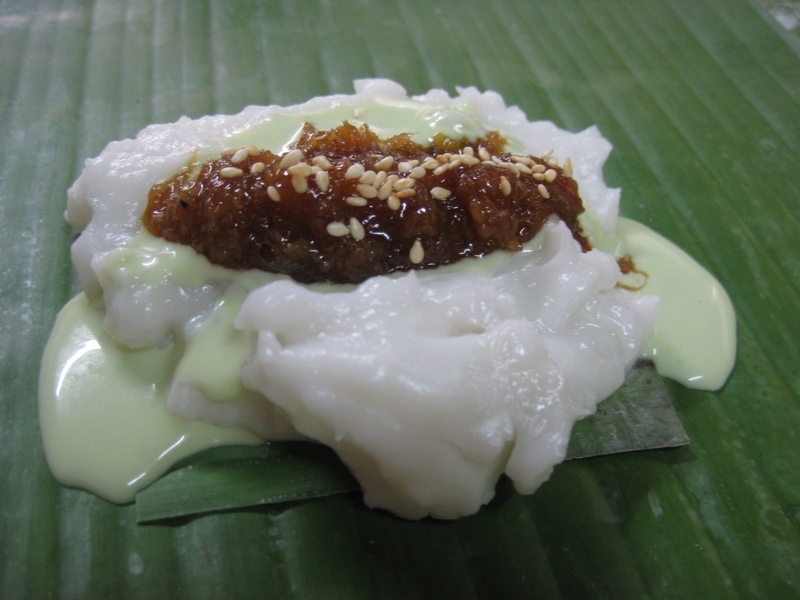 It was good but the Malay version had the glutinous rice in its full glory, which in my book is hard to beat. Cooking Nyonya food was a fascinating introduction to the culture and the history of Penang. It also gave me an appreciation for the complexity of the dishes that the hawkers are whipping up on the side of the road. This entry was posted in Chinese, Classes, Malaysia, Malaysian, Nyonya, Penang and tagged Assam Laksa, cooking class, Malaysia, Nyonya, Pearly Kee, Penang. Bookmark the permalink.